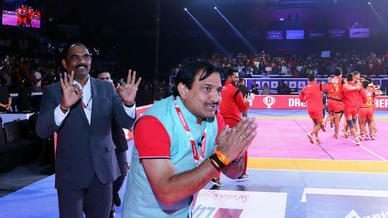 The big names delivered on a big night for Bengaluru Bulls as captain Rohit Kumar scored 11 points, including a High 5, and Pawan Kumar Sehrawat returned 13 raid points, to help them beat Gujarat Fortunegiants by a scoreline of 41-29 and seal a berth in the VIVO Pro Kabaddi Season 6 finale. The star raiders on both teams were off to a fine start as Sehrawat and Rohit Kumar picked up a couple of raids points each while Sachin scored five raid points in the opening six minutes to keep the scores even at 5-5. Sehrawat added another raid point to his tally with a touch on Parvesh Bhainswal but K Prapanjan’s first raid point of the night and a second two-point raid from Sachin gave Gujarat Fortunegiants a two-point cushion. That lead did not last long, though, as Rohit Kumar’s successful bonus points attempt and Ajay’s tackle on Prapanjan levelled the scores at 8-8. 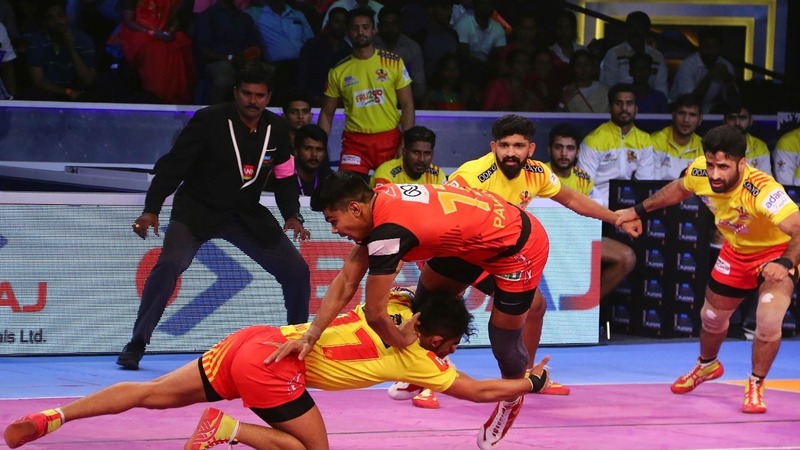 Ruturaj Koravi’s Thigh Hold on Sehrawat got Gujarat Fortunegiants their first tackle point of the night in the 11th minute but Bengaluru Bulls’ raiders continued to pile on the points as Rohit Kumar and Sehrawat added a touch point each to their team’s score. Gujarat Fortunegiants answered back in some style by scoring four points on the trot to reduce Bengaluru Bulls down to just three men on the mat. 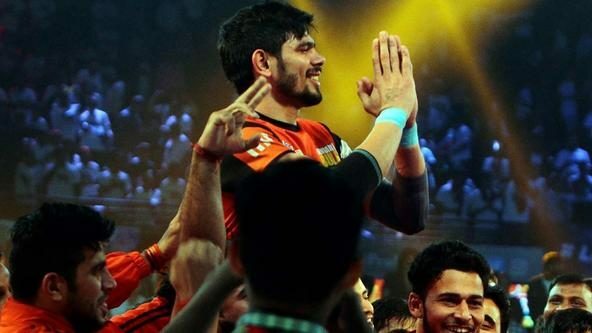 But substitute Sumit Singh went in for a Do-Or-Die raid twice in the closing stages of the half and delivered on both occasions as the teams headed into the break with Gujarat Fortunegiants leading 14-13. Both defensive units fared better in the opening exchanges of the second half as Mahender Singh and Ajay scored a tackle point each for Bengaluru Bulls while Ruturaj Koravi and Hadi Oshtorak scored one each for Gujarat Fortunegiants. Prapanjan’s touch point on Sumit Singh momentarily put Gujarat Fortunegiants up by two points, but a raid point from Harish Naik and a tackle point from Mahender levelled the scores yet again from Bengaluru Bulls. 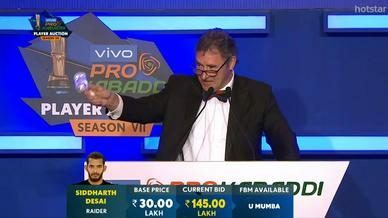 Oshtorak’s tackle on Naik was followed by Sachin picking up a raid point in each of his next two raids leaving Bengaluru Bulls with just two men on the mat. Prapanjan got a touch on Amit Sheoran and Parvesh Bhainswal got his first tackle point of the night to inflict the All-Out on Bengaluru Bulls. A Super Raid from Sehrawat, followed Rohit Kumar’s tackle on Prapanjan, reduced Gujarat Fortunegiants down to just three men. 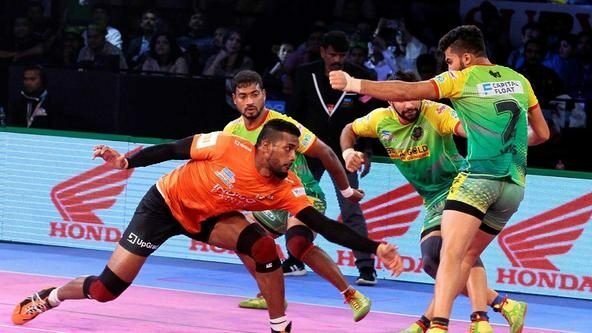 In the subsequent raid from Sehrawat, Bhainswal stepped out of bounds and, after getting a touch on the other two defenders, Sehrawat got his hand across the midline to inflict the All-Out and put his team up by three points. Sehrawat went on to add two more raid points to his tally in his next two raids and Rohit Kumar scored his third tackle point of the night with a Block on Sachin as Bengaluru Bulls scored 13 unanswered points to take a seven-point lead in the match. 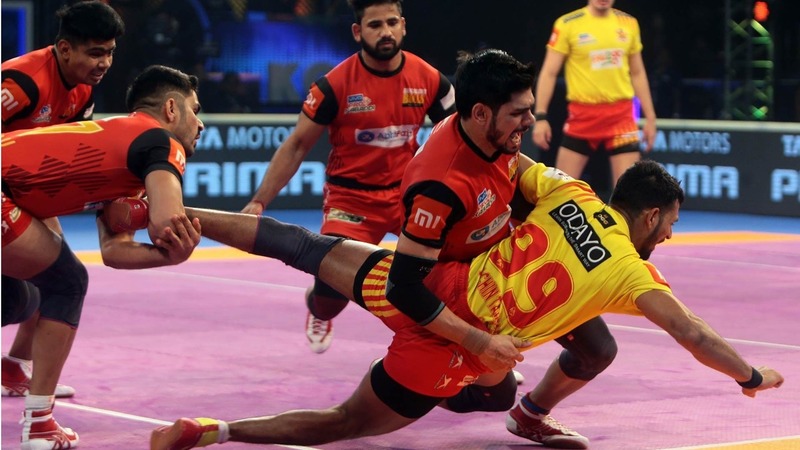 Oshtorak’s two-point raid finally curbed Bengaluru Bulls’ run, but two more tackle points from Rohit Kumar followed by a two-point raid from Sehrawat left Gujarat Fortunegiants with just a solitary man on the mat. Mahender made short work of the raider, tackling him out of bounds to inflict the All-Out and push his team’s lead up to 11 points. 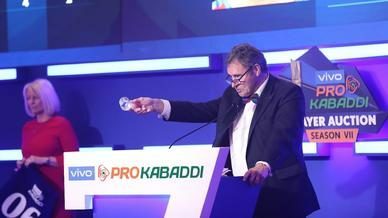 The defender also scored the last point of the match with a Dash on substitute Dharmender, as Bengaluru Bulls won the contest 41-29, outscoring Gujarat Fortunegiants in the last few minutes.